I hope you are off to good start to your weekend! 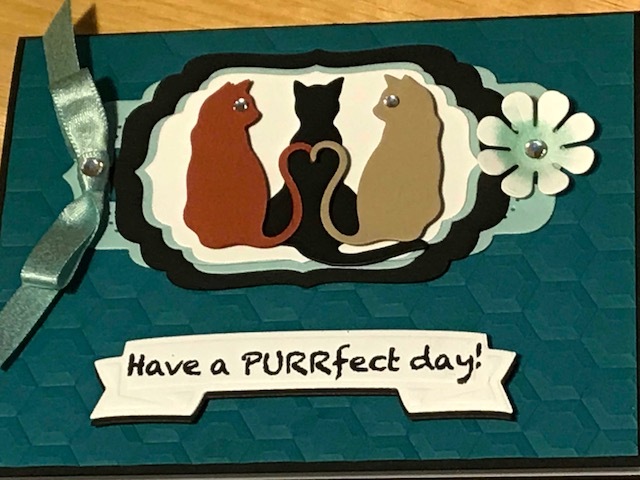 Here's a card that I really enjoyed making. And it's almost all die cuts. I first cut all the cardstock to the size of card I want and die cut the images. The base of the card is made from black cardstock and the background is made from teal. 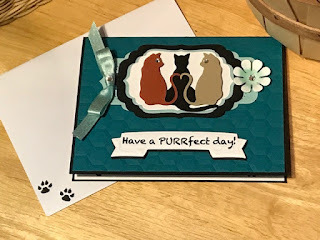 This layer is dry embossed using a honeycomb pattern. The cats are cut from three different colors - black, tan, and rust. 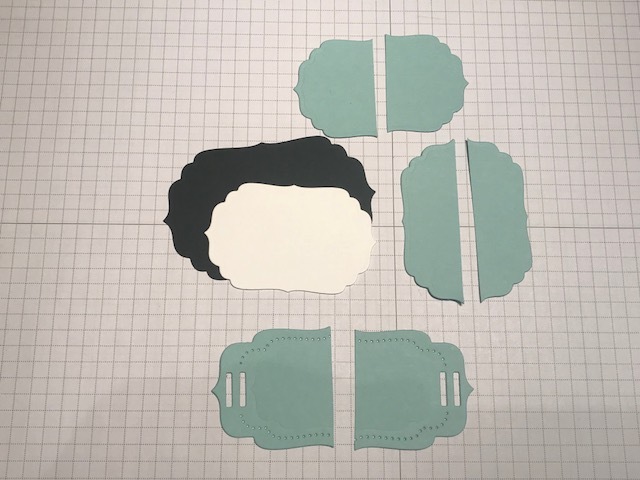 The labels are cut from light teal or aqua, black and white. I then made the embellishments. I used an aqua satin ribbon with a crystal rhinestones that will be attached to the main focal point. The sentiment is stamped in black on the white banner label. To give it added dimension, a black banner is also cut and adhered slightly offset to make a shadow. 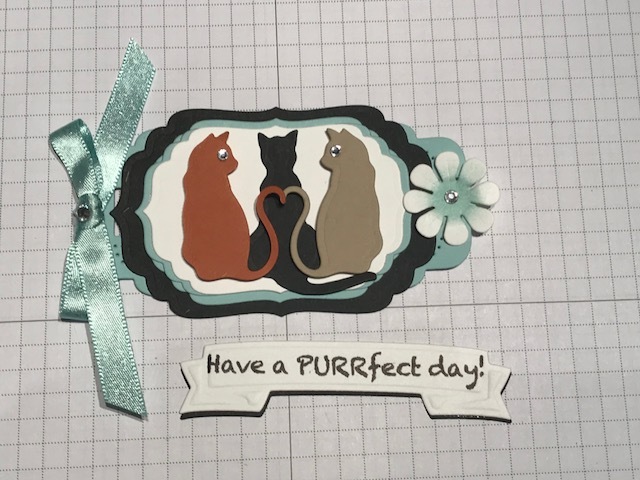 I also added rhinestones as eyes to the cats and as the center of the flower (used a sponge dauber to color the center of the white flower). To make the focal point of the card, I cut the aqua colored labels in half as shown below. The aqua labels are the same size as the white. I adhered each end of the longer label under the black label. Then I adhered the smaller aqua labels under the white one with the aqua edge just visible. Then I attached that piece on top of the black label. 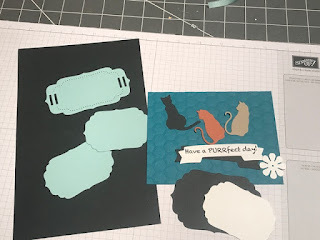 Layered on the cat die cuts so the tails just touch (almost looks like a heart). Then attach the label and the flower, and the focal point is done. 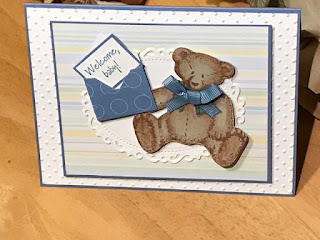 I attached the dry embossed background piece to the card base. 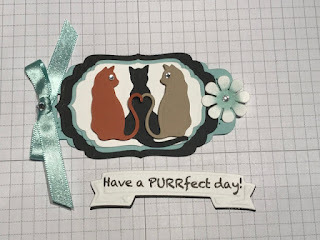 Then added the layered label focal point and the sentiment. I also added a white piece of cardstock to the inside of the card and stamped paw prints in the bottom corners as well on the envelope. 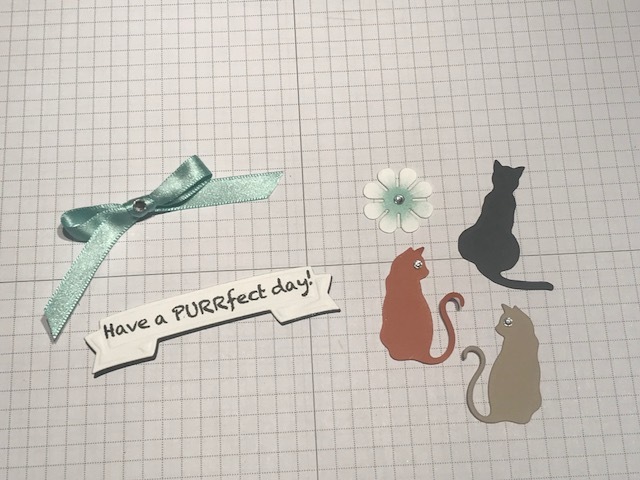 This makes a great birthday card for those cat lovers in your life. I hope you give die layering a try to make focal points for your creations.